Massive Audio - CORE-1 | CORE-1 | Endstufen | Toms-Car-Hifi - Kaufen was Freu(n)de macht! Massive Audio of So Cal USA is releasing its masterpiece: The CORE-1. It is a state-of-the-art Digital Signal Processor and a precise Power Management tool for those who seek for Seamless OEM integration, High Fidelity (SQ) or High Performance (SPL) audio! 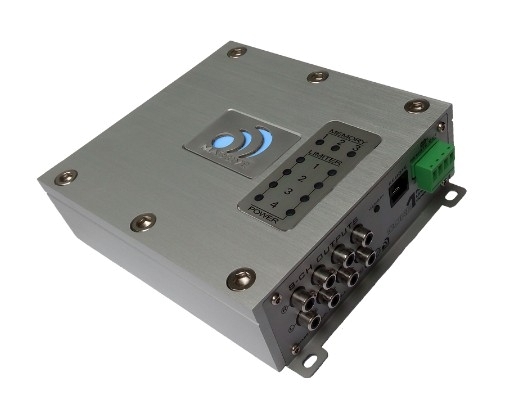 With 8 channels in / 8 channels out, 56-bit double precision signal processing and 24-bit resolution ADC/DACs, it brings outstanding sound quality and adds sophistication to your car audio system. The Multi Language Windows™ based software written by Massive Audio engineers is presented with user-friendly interface that allows for complete system setup in minutes. At the same time, it lets you manually fine tune every parameter for precise acoustic and power management. Audiophile sound quality and full battery & speaker protection define the CORE-1! Size: 5.83" x 6.46" x 1.9"